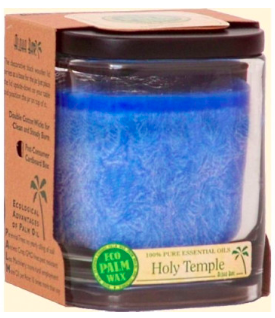 Eco Palm Wax sourced from certified organic palm groves in South America. Eight ounces each. Burn time is 40 hours. The decorative black wooden lid serves as a base for the jar. Just place the lid upside-down on your table and position the jar on top of it. Double cotton wicks for clean and steady burn. Post-consumer cardboard box.